The blower I made from an old vacuum cleaner is quite powerful, in fact it gives a noticeable thrust on it's own. By mounting it vertically on one end of a balance (a length of Al shelf support) and hanging a known weight on the other ( a 1lb hammer) I was able to get an estimate of the thrust. That came out as 0.62 Newtons. 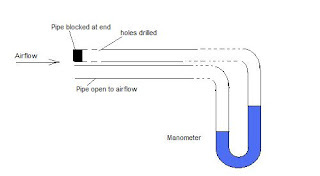 The turbine cross-section area is also 0.0016 m2 (happy coincidence) so velocity at the turbine should also be 18m/sec also when the blower is used to drive the engine cold. This corresponds to a calculated peripheral velocity of 26m/sec and angular velocity 10,000rpm (NGV and turbine blade angle both 35o). N.B. A small 'flag' held aft of the turbine shows no residual rotation of the airflow. This gives me a lot of confidence in the turbine itself. Using a couple of pieces of small diameter plastic pipe (3mm), I measured the 'ram' pressure with my water 'U' tube manometer. It came out at 1.4 cm H2O which is equivalent to 1.4 millibar. so v = 15.275 - which agrees well with the expected value. This means I can measure flow speed reasonably accurately using a simple manometer. That's a bit of a breakthrough. I have a motor that I can use to drive the compressor at about 15000rpm. So if I connect a pitot tube to the outlet of my test rig, I should be able to examine the behaviour of the compressor with that goal in mind.